RT12 has his Hawaiian name! He is Kimo Kai, or “Sleepy Ocean”, named by (and after) vacationing volunteer Jim Maser when RT12 was just a couple of weeks old. After checking with our Hawaiian cultural practitioners, we have now made it official! 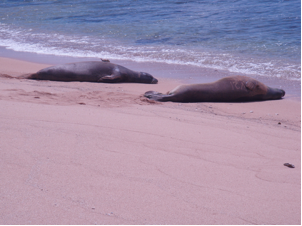 Mahalo-eha (RA36) has been spotted back at his natal beach, Maha’ulepu! Love is in the air for Kauai’s seals! We have seen lots of male-female pairs hauled out, entering, and exiting the water together lately. Some of these included large adult female RK13 with Oahu/Kauai male RO18; scarred female RK30 with our old, dominant male TT40, seven-time mom RK12 with young adult male R4DI, and Oahu male Kermit (RO12) with an unidentified female. Even little juvenile Kaikoa (RA00) has been seen several times with subadult male RV18, though this pair is too young to mate! Kermit (RO12), as mentioned above, has returned to Kauai. But check out what he was doing this summer!! 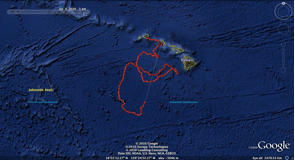 He had a 2000-mile journey into the pelagic (open-ocean) realm! Back on the east shore of Kauai, Kermit lost his cell-phone tag. Thanks to one of our observant and thorough volunteers finding the tag in the sand, we can now learn more about Kermit’s adventure and reuse his tag to track another seal!